From iconic beachfront communities to whimsical hinterland villages, the City of Gold Coast is diverse a landscape of people, places, and experiences. Within its 415 square kilometre boundaries the Gold Coast offers regions characterised by their coastal, cosmopolitan, rainforest, rural, man-made and pristine environments. 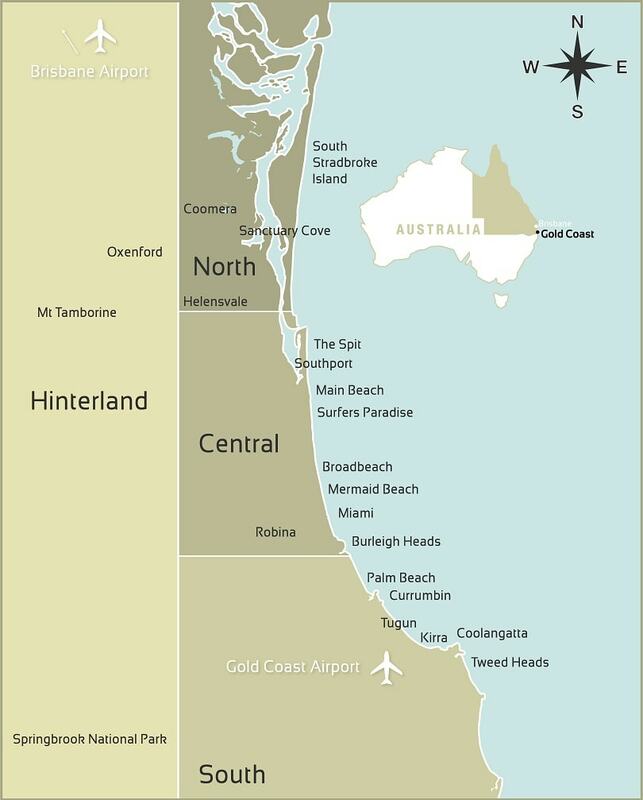 The map below shows the Gold Coast segmented into north, central, south and hinterland regions. Select a region from the map below for more information. The northern region of the Gold Coast stretches about 20 minutes' drive from Surfers Paradise live the famous Gold Coast theme parks. Here the skyline is intersected with towers of terror, aqua loops, and rollercoasters while the wind carries screams of delight from every direction. In a 1km radius there are six major themed attractions including Dreamworld, Whitewater World, Wet 'n' Wild Water World, Paradise Country, Warner Bros. Movie World, and Australian Outback Spectacular. With exhilarating rides, exotic animals and endless waterslides to help you cool off on hot summer days, the northern Gold Coast theme parks offer the full spectrum of interactive entertainment. Sanctuary Cove is an experience of the good life, where boating, golfing, shopping, dining and entertainment all come together to enjoy each other's company. The stylish Marine Village with its restaurants, bars and boutique shops is at the heart of the precinct, but the surrounding championship golf courses and scenic calm waterways are the real stars of this stage. Speaking of stars, Frank Sinatra opened Sanctuary Cove in 1987 with Whitney Houston and Peter Allen as support acts. The Gold Coast Broadwater is a great expanse of easily accessible calm water between the Gold Coast mainland and South Stradbroke Island reaching all the way north to the World Heritage Listed Moreton Bay. It is a recreational watersport arena with plenty of room for locals and visitors to sail, fish, jet ski, parasail, scuba, cruise, kite surf, jet boat, kayak, swim, paddle board, snorkel, wind surf, picnic... you get the idea. The Gold Coast's central precincts are all about fun, entertainment, nightlife and attractions. The lively quarters of Surfers Paradise, Main Beach, Broadbeach, and Burleigh Heads attract locals and visitors with their bright lights, nightlife, cool vibe, and popular 'see and be seen' beaches. You can easily fill your day with thrill rides, water slides, jet boats, shopping safaris, surf breaks, beach walks, people watching or picnicking. Some of the features of these precincts include the spacious Broadwater Parklands with its native landscaped gardens, range of free BBQ areas, adventure playground, and calm water swimming beaches. The Surfers Paradise Foreshore offers the perfect space to take in the world-famous beachfront in all its toned, tanned, and golden glory. Surf Parade Broadbeach is a favourite restaurant, café, bar, and nightclub strip which may not be as extravagant as its Cavill Avenue cousin in Surfers Paradise but offers the new wave of Gold Coast glitz. Burleigh Head National Park is a bushwalk, whale watch, and scenic lookout adventure in the imposing over one of the Gold Coast’s most iconic surf beaches, the scene is loved by locals and visitors alike. The further south you go on the Gold Coast, the more space you find. Southern precincts such as Currumbin, Kirra, and Coolangatta are idyllic coastal communities defined by their own individual stretches of sub-tropical coastline. From the one of the world’s best surf breaks to some of the Gold Coast’s laziest secluded coves, the southern stretches are an inviting part of Australia’s iconic beach culture. The general vibe of these areas is laid back and organic, but each has its own wonderful personality. Currumbin is an active community where lovers of watersports, hiking and nature take advantage the Currumbin Creek waterway which links the pristinerainforested mountains of the region to the open golden beach. The Currumbin Valley starts just two kilometers from Currumbin beach and leads visitors easily into a World-Heritage-Listed rainforest, the Cougal Cascades waterfall, abundant native flora and fauna, and the pristine eastern section of the Gondwana Rainforests of Australia. Kirra is famed by surfing superstar Kelly Slater as his favorite point break on the planet, the legendary Kirra barrel is a spectacle to behold as it roles in perfect formation up the coast with surfers jumping onboard like acrobatic passengers on a locomotive. Coolangatta is an authentic microcosm of old-school Aussie surf culture where Kombi vans and Kingswood cars fill the beachfront car parks and retro buildings and signage from the '60s and '70s gives the area a vintage film-set feel. Tamborine Mountain sits just 30 minutes west of Surfers Paradise, but it may as well be another world away. This charming mountain village is full of food, wine and whimsy. Several degrees cooler than the sea-level regions of the Gold Coast, Tamborine Mountain also has a discernibly different culture. Quaint bed and breakfasts, antique toy stores, and wineries offering gourmet cheese plates and Devonshire teas create an old-world, European ambiance. There’s a strong community feel with dozens of farmers selling fresh produce from roadside stands. In its prime position with verdant national parks on one side and fertile farmlands on the other, Tamborine Mountain and the adjacent Canungra Valley offers a total escape into a true country lifestyle. Driving up the steep mountains to visit Lamington and Springbrook National Parks creates the impression that you’re entering a land before time - and in a way, you are. Living, breathing relics from the ancient Gondwana rainforests, both have been world heritage listed by the United Nations Educational, Scientific and Cultural Organisation (UNESCO). This means they are protected as outstanding places of natural and historical value to the planet. A short hike through their lush landscapes makes it easy to see why; the flora and fauna is stacked floor to canopy with rare species, making the area a hotbed for international science and conversation organisations. More than just a magnificent Gold Coast tourist stop, these historic forests are one of the natural treasures of the world.